From LIFE to death within a year. Judy Tyler was on the verge of a big film career when she died at age 24 in a horrible car accident on July 3, 1957. Born Judith Mae Hess to a musician father and showgirl mother, lovely Judy quit school at age 15 to start a modeling career. She was dubbed “Miss Stardust” (in a beauty contest) and by age 18 was taking acting classes and dancing in Manhattan nightclubs like the Copacabana. She also appeared on television’s The Milton Berle Show (ugh. poor her). Her short marriage to Copa pianist and vocal coach Colin Romoff helped her develop as a vocalist and she later became a headliner at The Mocambo. The couple later divorced amicably. In 1952, she was chosen to portray the (former puppet) character of Princess Summer-Fall-Winter-Spring on The Howdy Doody Show. She became the crush of young male viewers when – after a puff of smoke – the puppet Princess of the Tinka Tonka Tribe became a real live Indian maiden played by Judy with braided hair and headband. 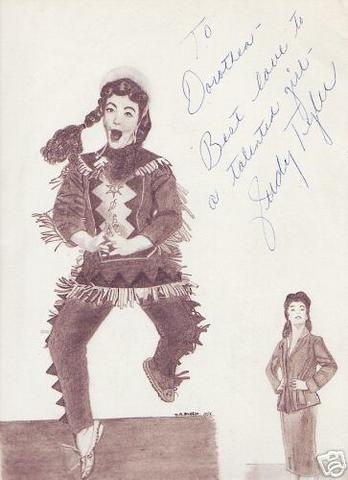 Here is a rare autographed picture of Judy that was auctioned off a while back. Judy left Doodyville in 1955 to take the ingénue role in a Rodgers & Hammerstein Broadway musical called Pipe Dream. Based on a John Steinbeck story, the Cannery Row-set musical featured Judy as a runaway living in a discarded boiler pipe who is led to true love by a benevolent brothel owner. 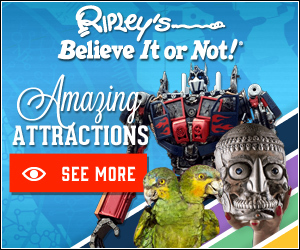 (They don’t make ’em like that anymore!) The show ran for 245 performances and was the closest thing the Broadway hit makers had to a “flop”. Songs/Photos of the musical can be found here. 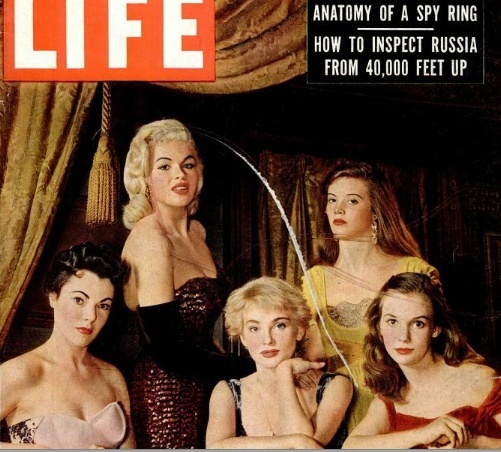 The “Pipe Dream” gig led to a cover of LIFE Magazine in 1956 in which she appeared with other Broadway up-and-comers including Jayne Mansfield. This wasn’t the only thing that Judy had in common with Jayne Mansfield. 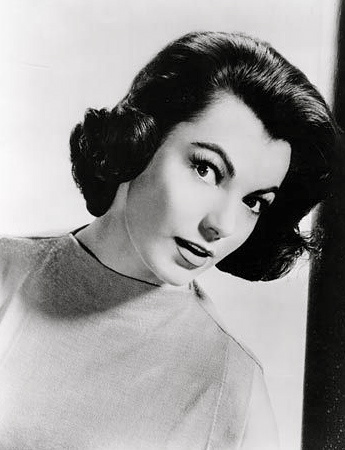 1957 was Judy Tyler’s big breakthrough year. She was cast as the lead in the musical Bop Girl Goes Calypso, and as Elvis Presley’s co-star in his 3rd motion picture, Jailhouse Rock, at MGM. That was also the year she wed her second husband actor/dancer, Gregory Lafayette. They had married on St Patrick’s Day at the Balmoral Hotel in Miami. Her maid of honor was How Much is that Doggie in the Window singer, Patti Paige. The couple settled into an apartment at 158 West 44th Street in Manhattan – (now the site of the Conde Naste building). 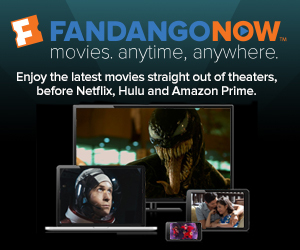 Soon Hollywood was calling with work in the previously mentioned film musicals. Judy’s actor hubby, Greg, accompanied her to “the Coast”. It was reported that Greg was barred from the MGM lot by the Jailhouse Rock producers for being disruptive. Judy also found herself under the spell of co-star Elvis’ charms. The pair reportedly were once scolded by the director for coming back late from a lunch break. Elvis usually became quickly infatuated with his female costars. Legend has it that Elvis was romantically involved with all of his screen loves – except Mary Tyler Moore (Change of Habit). Donna Douglas literally lost her mind over Elvis. Just weeks after filming wrapped on Jailhouse Rock, Judy and Greg headed back east by car (along with a new puppy and kitten). The couple were taking a leisurely drive across country to New York where she was due back to appear on a CBS-TV game show called Pantomine Quiz. 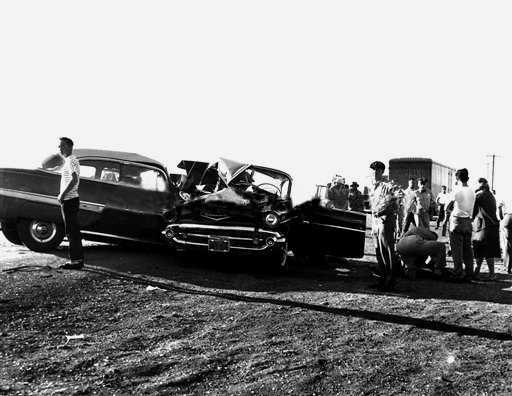 As their ’57 Chevy approached Wild Bill’s curio store and Petting Zoo – 3 miles north of Rock River, Wyoming – Greg swerved to avoid a car with a trailer pulling out into the southbound lane of US-287 in front of the tourist stop. Their car skidded into the northbound lane of US-287 and was broad sided. Judy was mortally wounded (cut in half) and died at the scene. A passenger in the northbound car was also killed. Her husband, Greg, died the next day at Ivinson Hospital in Laramie of a broken back. The pets in the car perished as well. Judy died about 5:50 PM – on July 3rd, 1957. She was 24 years old. According to some published sources, their car was looted of cash, furs and jewelry after the accident – but other reports say that a Milwaukee detective returned their personal effects to their loved ones. 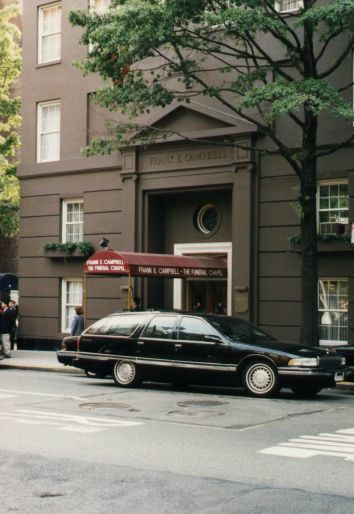 Days later, her body lay in state at Frank E. Campbell’s in Manhattan. She was cremated and was brought to her final resting place at Ferncliff Cemetery Mausoleum in Hartsdale NY. Bop Girl Goes Calypso was released on July 15th – a week after her death. Jailhouse Rock was released October 17, 1957. It is said that Elvis was so upset by Judy’s death that he could not bear to watch their film. Singer-actor Kenny Baker recorded a tribute song in her memory titled Goodbye Little Star. Profile by Mark Langlois. Thanks to Skinny Arbuckle for the inspiration.